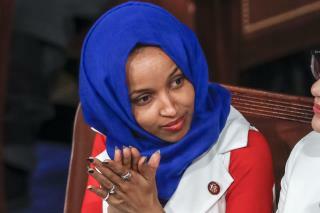 (Newser) – Things got ugly Friday at the West Virginia Capitol over a poster linking a newly elected Muslim congresswoman to 9/11, the Washington Post reports. Displayed as part of "WVGOP Day," the poster shows Rep. Ilhan Omar of Minnesota under an image of the burning Twin Towers along with the words, "'Never Forget' - You Said" and "I am the Proof - You Have Forgotten." Mike Pushkin, a Democrat in the state House, angrily tweeted a photo of the poster, but that's not all: A dispute erupted in which angry Democrats condemned the poster, a Democratic delegate angrily kicked open a door that injured a doorkeeper, and the body's sergeant at arms resigned after allegedly saying all Muslims are terrorists, per West Virginia Public Radio. this pathetic page is not allowing me to comment on these ratty muzzies! Don't trust anybody that wears a bath towel around their head. Some even wear diapers around their head.